After getting off to a flying start with a 2-1 home win over Kenya in Freetown in June 2017, Sierra Leone campaign for another Nations Cup appearance look set to face another difficult test with Ethiopia as their next opponent. 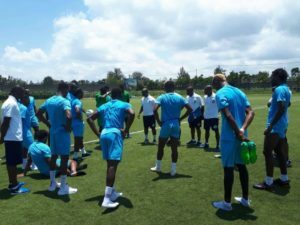 Leone Stars of Sierra Leone hopes of having a qualifying stake in Group F is so much keen on Sunday’s clash against the Walias of Ethiopia at the at the Hawassa City International Stadium. Coach John Keister’s preparation has been hit a little bit with the unexpected pull-out of his rock solid and experience skipper Umaru Zangally Bangura, who for the first time in many games, will be out of action for the country due to injuries. The former Sierra Leone midfielder received another blow after FC Sheriff Striker, Alhaji Kamara and newly recruited Coventry City striker Amadou Bakayoko all pulled-out from his squad. However, there was some positive news for the tactician’s who could have former IFK Frej defender, Alie Sesay, as a possible replacement for the injured skipper, Bangura. Sesay returned to the Sierra Leone squad during last month’s international goalless draw with the Lone Stars of Liberia and his outstanding display saw him as a possible replacement for Bangura. Despite the no show of Alhaji Kamara and Amadou Bakayoko, coach Keister could still be having headache in selecting his striking options with the likes of informed veteran strikers, Kei Kamara, Christian Moses and Mohamed Buya Turay. Also newly signed Panetolikos forward Alhassan Crespo Kamara and Sheka Fofonah would be returning to the squad giving coach more striking options. “Considering the standing, I would love to get a perfect result in Ethiopia which will be good for us in terms of keeping our hopes alive of reaching Cameroon 2019,” said head coach John Keister. Sierra Leone are seen as the favourite going in Sunday’s clash considering their power ranking above the Walias in both FIFA and CAF but the newly recruited Ethiopia coach, Abraham Mebratu, wants to turn things around after their 5-0 defeat to Ghana. Mebratu,who recently named his 23 man squad for the Group F encounter against Sierra Leone and Kenya dropped notable goalie Abel Mamo, playmaker Tafese Solomon and defender Addis Tesfaye. However, Ethiopian U-20 national side custodian Tsion Merede was a surprise inclusion,while veteran forward Getaneh Kebede and experienced duo, Behailu Assefa and Samson Assefa all made the final cut . This will mark the first meeting between the two sides as the Walias are pointless after a 5-0 loss to Ghana in Kumasi in June 2017. Sierra Lone are with three points after beating Kenya 2-1 in Freetown. Defenders: Kemson Fofonah, David Simbo (Kiremithane Spor Turkey), Hassan Milla Sesay (FC Lathi, Finland), Abu Suma (Unattached) Osman Kakay (QRR, England), Alie Sesay (AOX Kissamikos Greece) and Yeami Dunia (Standard FC). Attackers: Kei Kamara Vancouver Whitecaps Canada, Alhassan Kamara BK Hacken Sweden, Ibrahim Conteh PSIS FC, Malaysia, Kwame Quee UMF Vikingur, IcelandIcel, Mohamed Buya Turay Sint Truiden Belgium, Sheka Fofanah Al-Nasr Oman, Christian Moses Viborg FF Danmark.